The most popular techniques include woodcut, wood engraving, linoleum cut, relief intaglio and collograph. Lynd Ward. Midsummer Night. 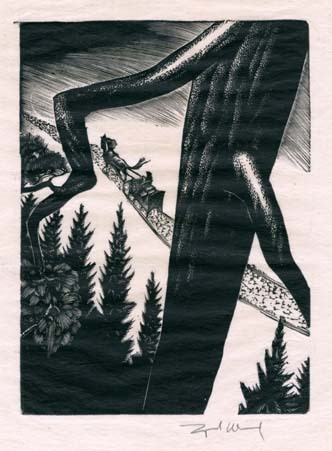 A scene of a large tree trunk in the foreground and a horse and sled going up a hill in the background, wood engraving, (4 1/2" x 4 1/4") 1930. In relief printing, you cut away or recess what you do not want to print. The print is made from what is left of the original surface. The image is transferred by rubbing the backside of the paper after it is placed face-down on the fully inked block. PINE Pine is the most prevalent soft wood available for woodcutting. The White or Sugar Pine is considered the best of the Pine family. It is firm and even grained and can be cut in any direction. Southern Yellow pine has a strong grain pattern and it varies in hardness in the different rings of the wood. Unless you want to use the grain pattern in your image, avoid this type of wood. POPLAR Poplar exhibits a smooth, even grain and is excellent for woodcutting. You can cut both with and across the grain. The only drawback is that your tools must be sharp or Poplar will display some ragged edges. BASSWOOD is very similar to Poplar. It possesses similar qualities related to cutting, and has the ability to hold detail. PLYWOOD can be used for woodcutting. The secret is to select the plywood by the surface laminate. Look for the thickest laminate to achieve good results. Plywood allows the artist to work on very large images. Woods such as maple, birch, and walnut are very hard to cut. All theses woods do provide the artist with the potential for very elaborate line detail and intricate surface work. Because of the degree of hardness of these woods, tools need to be sharpened frequently. Fruit woods such as apple, cherry, and pear are considered the finest for making woodcuts. These woods are hard, even-grained and allow for very fine detail. These woods are also expensive. The woodcut knife is the most important of the woodcutting tools. The knife must be held firmly to control the cutting. The hand that is not used to grasp the knife should be used to aid in guiding the tool through the course of any given cut. The knife is used to delineate edges and create lines. The knife should be held at a 40 or 60 angle. The knife should never be held perpendicular to the block. The cuts do not need to be deep to be effective. As one uses the knife, a comfortable position will be found for holding the tool. There is no one proper way to hold the tool. Each individual will find the most comfortable way. An Exato knife can serve as a good subsitute for the traditional wood-cut knife. Gouges are used for clearing areas of the block that are to either be white or hold a given textural surface. Gouges come in a variety of configurations. The three that will you become most familiar with are the V, C, and the U shaped gouges. The C shaped gouge is used to clear large open areas of the block. The U gouge works well in confined areas where good control is necessary. Both the U and the V gouges can be used as drawing tools to create a variety of white lines. All the gouges must be honed to a sharp edge to achieve the desired results. For individuals new to this type of manual labor do not mistake lack of strength for the sharpness of the tools. The tools will need to be sharpened sometime during your woodcutting experience. This task should be accomplished under the guidance of the studio instructor. There are three basic methods to put the image on the block. The first solution is to draw your image directly on the block. Using a good pointed brush (#7-9 watercolor) and India ink proceed to create a black and white image on the surface of the block. When finished the block should be stained with a slurry of a middle to dark value of a colored oil-based ink. This covers the original value of the wood and allows you to see each cut that your make on the block and to judge the results. The second method is to transfer your image to the block using a transfer paper method. Once an image of either graphite, carbon, or iron oxide has been transferred to the block, the image should be completed using the same steps as was employed in the direct drawing image. The final method is one that has been used through out the history of printmaking. A thin piece of paper is placed over the original drawing. A complete tracing with brush and India ink is made on the thin paper. The wood block is then given a thin coat of a water soluble paste or glue (Wheat paste, 'Yes' Glue, Wallpaper paste). The paste is smoothed onto the block. The thin paper image is then pressed face down on the block and the two are adhered together. After the block is dry the extra paper around the edges can be removed and cutting can begin. In beginning the woodcut it is best to leave as much black as possible during the early development of your block. Do not try to cut the image to its final form, but locate the basic shapes and forms, and pull proofs to exhibit the progress that you are making on your image. Do not pull an image before you have at least cut out the basic shapes and lines that define your image. When cutting make sure that you never make cuts toward yourself. Keep your hands behind the direction in which the cutting tool is moving. Always place the block on a desk, a table or a steady surface. Never cut the block while it is resting on your lap. To aid you in holding the block secure, a bench hook can provide an advantage. Brayers are the rollers that are used for inking the block. They should be firm, but not too hard or too soft. A roller that is too hard will not be able to cover all the subtle changes that occur in the wood block's surface. On the other hand, a roller that is too soft will have the effect of clogging up many of the finer elements in the image. The quality and the appearance of the paper you use for your woodcut will have a deciding effect on the aesthetic outcome of the image. Although we will use newsprint while the image is in the proofing stage, the final prints will be pulled on oriental papers. The oriental papers recommended are not sized nor do they need to be dampened. The papers that we recommend are Moriki (a sturdy, translucent sheet), Hosho (a bright opaque sheet), Kochi (a heavy warm opaque sheet) and an inexpensive sheet, Tableau (a warm, translucent sheet of American origin). The recommended ink in Print Survey is Block Print Black from Graphic Chemical and Ink Co. If this isn't available, the Speedball brand, oil based, that comes in a tube will work quite well. Intaglio and lithographic inks are not recommended. Sexauer, Donald. Print Survey Relief Hand-out, East Carolina University, Greenville, NC. 1979. Grabowski, Beth. A Printshop Handbook, University of NC, Chapel Hill, NC. Brown & Benchmark, 1994.